The Bears held the 14th of their 15 scheduled spring practices Wednesday, the first day of spring. Inside linebackers coach Peter Sirmon liked what he saw during the drill, which begin under rain skies and concluded in sunshine. The defense seemed to dominate during the team drills, making life difficult, sometimes impossible for the Cal offense. In the red zone drill early in the practice, the defense did not allow the offense to cross the goal line once. As offensive line coach Steve Greatwood does with his charges DeRuyter, who handles outside linebackers, and Sirmon shuffled their troops around. “I think guys get excited to have a different role,” DeRuyter said. ”It’s the last week of Spring Ball, only so much you can do in a base defense, showing new things. This keeps them involved, and if we do have injuries, guys have played a different position. Outside backer Cameron Goode, who is coming back after missing virtually all of last season with an injury, had a particularly impressive day. He spent almost as much time in the offensive backfield as quarterback Chase Garbers did. “He’s done so many reps of what we are asking him to do, he is just a really natural player at doing it,” DeRuyter said. “He is going to have some rust, not playing at all last year other than the first game, but he’s come out here. Maybe the first week, he had a little bit of rust to knock off. Linebacker Colt Doughty and defensive lineman Zeandae Johnson had some noticeable moments stuffing run plays. Garbers and Devon Modster again did the bulk of the quarterbacking. The day wasn’t all bad for the offense. Modster demonstrated some mobility, ducking away from a rush and hitting Ben Skinner down the middle through a few defenders. Showing a real comfort level with tight end Gavin Reinwald, Garbers was flushed from the pocket, then knowing exactly where Reinwald would be, hit him between the numbers. Redshirt sophomore wide receiver Evan King made a nice run on an inside reverse. 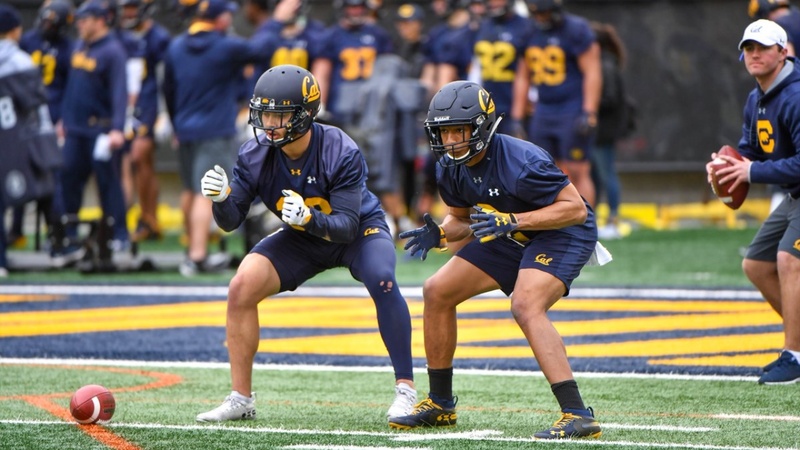 Thursday is Cal’s annual Pro Day, in which 13 of last season’s seniors will perform various tests, running, jumping and lifting, for a group of NFL scouts and executives. It begins at 10:30, and the events that take place in Memorial Stadium will be open to the public. Probably the most prominent participant will be last year’s co-captain linebacker Jordan Kunaszyk. Running back Patrick Laird, the other co-captain, will also be participating.